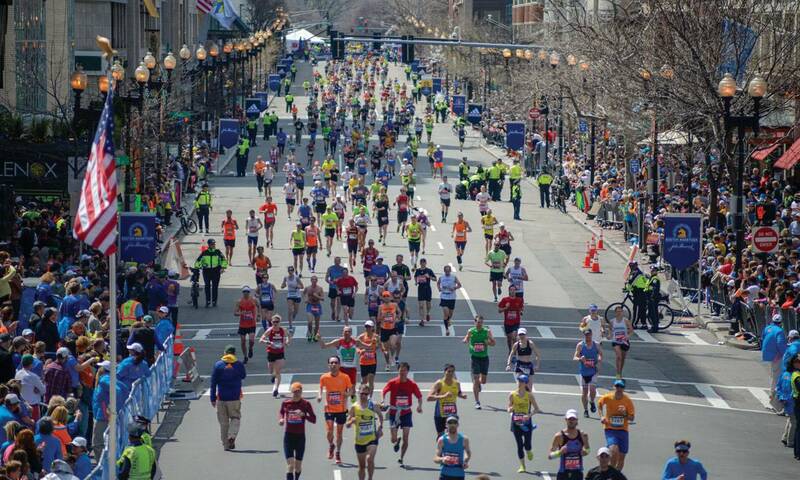 With it's highly competitive qualifying times, The Boston Marathon is known for being one of the world's most exclusive marathons. But it's not just the elite runners that make this race special — it's also steeped in history — part of what makes this marathon so unique is all the ways the spirit of Boston shines through. Check out some of the fun traditions that have developed over the years. Many likely know about the widely recognized tradition of placing olive wreaths on the heads of the first-place male and female winners. But this ceremonious tradition stems from the marathon’s birthplace, Marathon, Greece. In fact, each year a ceremony is hosted by the Consul General of Greece in Boston where the wreaths, made from green olive branches, are presented to Boston and race officials to commemorate and celebrate the bonds (or olive branches) that link all of us. Chris Laudani, a bartender at a nearby Boston restaurant, became a sensation this winter when he took the time to shovel the finish line on Boylston Street; an area that was pummeled by snow this season. A runner himself, Laudani is now one of those true Boston friends. Since the first Boston Marathon in 1897, the women of Wellesley College have cheered on the participants. But during the past 40 years, their section of the race has morphed into a "scream tunnel" with students rotating to keep a consistent cacophony of cheers. Runners claim that they can hear it from more than a mile away, which provides the perfect boost at the halfway point of the race. And as a bonus, some of the women have been known to provide kisses to the racers, too. Heartbreak Hill is literally on a hill that sits between miles 20 and 21 of the race, just near Boston College. While hills are normal – though challenging – for this course, this specific ascent comes at a portion of the marathon where muscle glycogen stores are most likely depleted (what most runners call "hitting the wall"), making the final stretch before the finish line particularly challenging. Every year since 1903, the Boston Red Sox play a morning home game on Marathon Monday. When the game ends, the crowd empties into Kenmore Square to cheer on the runners as they reach the final line. From one sporting event to another, the spirit is contagious. There's a method to race day madness, which includes qualifying for and signing up for a spot to run The Boston Marathon. And yet, each year there are a handful of runners who just jump the line and go! While there's been a huge effort to weed these people out, each year more than 50 marathon crashers manage to run the entire 26.2 and finish unofficially. Every year, hundreds of spectators gather at the Newton Firehouse to cheer on friends as they reach mile 16. This well-known red brick station marks the sharp right the racers must take as they face the daunting Newton hills. The Boston Marathon became the first major marathon to include a wheelchair division competition in 1975. That’s thanks to Bob Hall, who with a time of two hours, 58 minutes, collected on a promise by then Race Director Will Cloney that if he finished in less than three hours, he would receive an official Finisher's Certificate. He was the first of many to follow in his legacy. The Boston Marathon is part of the Abbott World Marathon Majors a series of six of the most elite races from around the globe.